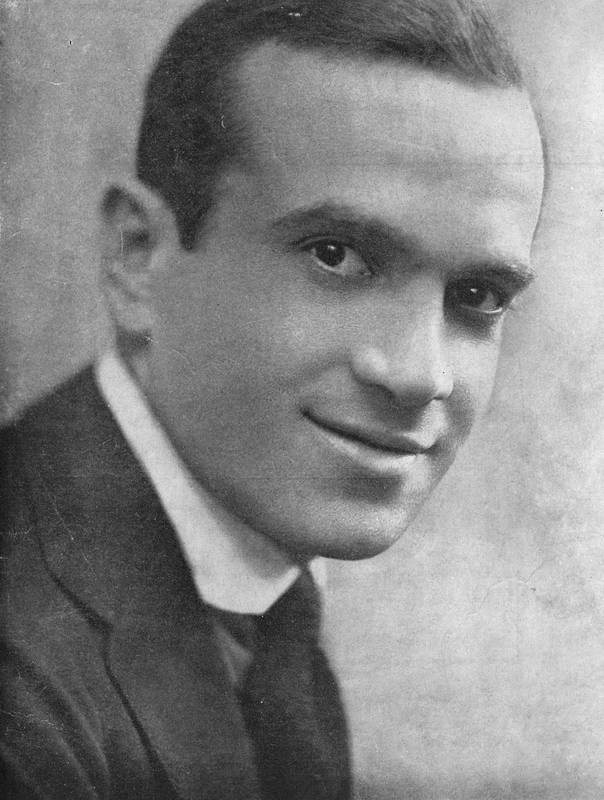 Al Jolson, circa 1920. From “Swanee” sheet music cover. On May 26, we celebrate the anniversary of the “World’s Greatest Entertainer”, Al Jolson’s birth. From the 1910s to the 1930s, Jolson was among America’s top entertainers. Here he is with one of the finest bands of that era, that of Isham Jones. Jolson was born Asa Yoelson in the Russian Empire, and emigrated to the United States in 1894. His actual date of birth was never known to him, be decided to go with May 26, 1886. The young Jolson was introduced to show business in 1895, and began performing on street corner with his brother Harry. By the beginning of the 20th century, the Jolson brothers were working on stage in burlesque and vaudeville, but soon the team broke up, and Al was left working solo. Jolson made his Broadway debut in 1911 in La Belle Paree, and in 1919, he appeared in Sinbad and introduced “Swanee”, “My Mammy”, and “Rock-a-bye Your Baby with a Dixie Melody”. Jolson also made his first records in 1911, for Victor. He switched to Columbia Records in 1913, and then to Brunswick in 1924, with whom he remained until picking up again with Decca in the 1940s. 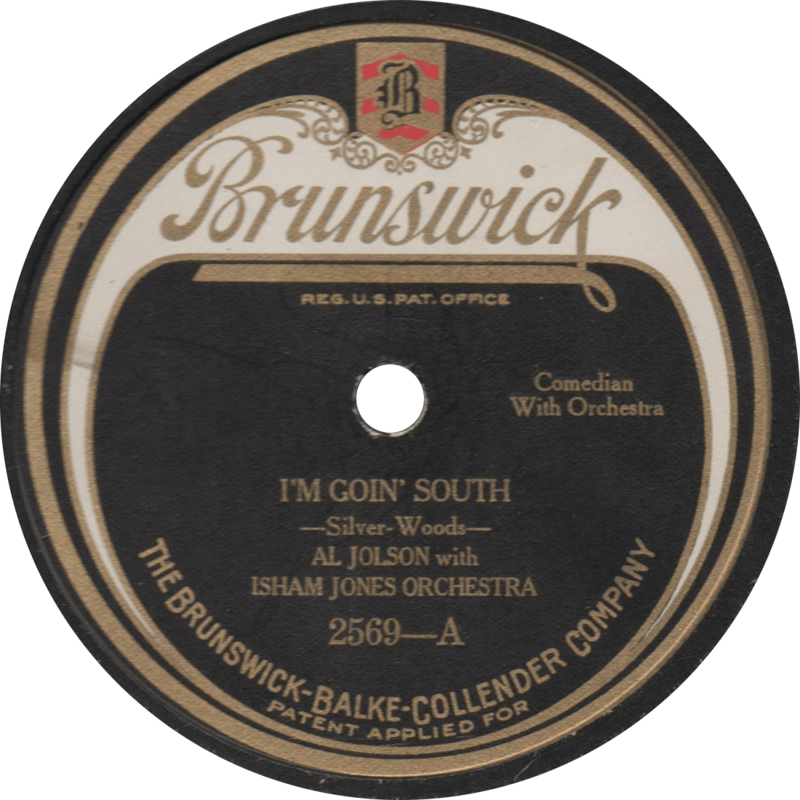 Brunswick 2569 was recorded January 17, 1924 in Chicago, Illinois by Al Jolson, accompanied by Isham Jones’ orchestra. Both sides come from Jolson’s first session with Brunswick. The band likely included Louis Panico on cornet, Carroll Martin and Bud Graham on trombones, Al Mauling on alto sax, clarinet, and oboe, Isham Jones on tenor sax, Artie Vanasec on soprano sax and violin, Leo Murphy on violin, Al Eldridge on piano, Joe Miller on banjo, John Kuhn on tuba and Arthur Layfield on drums. “I’m Goin’ South” is typical Jolson fare, hammy vaudeville about going back home to Dixie. I’m Goin’ South, recorded January 17, 1924 by Al Jolson with Isham Jones Orchestra. Turn the record over, however, and you’ll find one of Jolson’s all time best, one of my favorites, “California, Here I Come”. This side also features a ukulele solo by the composer himself, Buddy DeSylva. His 1946 Decca version has got nothing on this one! 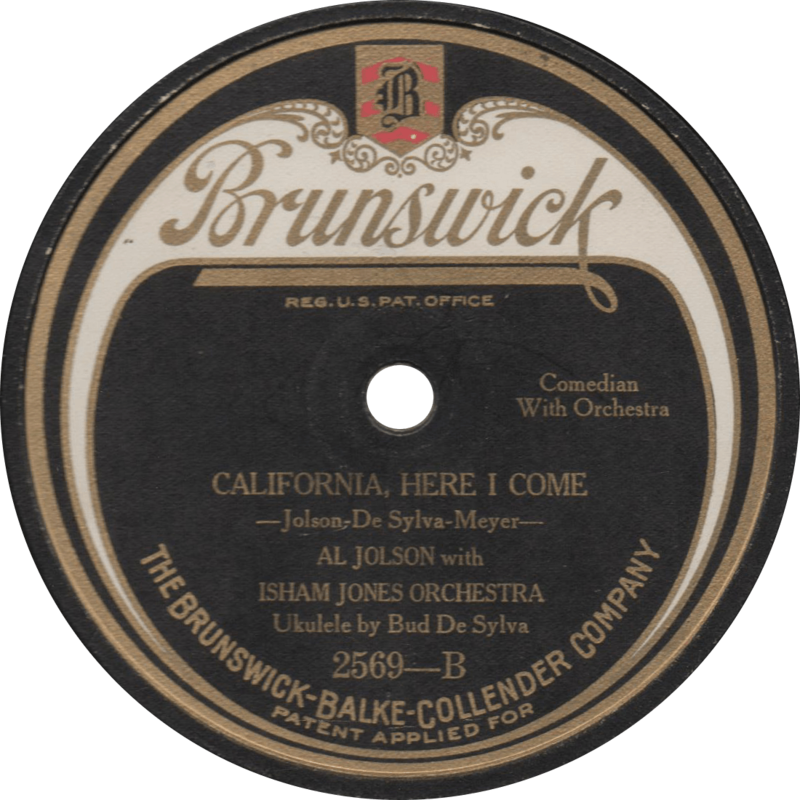 California, Here I Come, recorded January 17, 1924 by Al Jolson with Isham Jones Orchestra. Updated with improved audio on May 26, 2017. This entry was posted in Records and tagged 1920s, 1924, Al Eldridge, Al Jolson, Al Mauling, Arthur Layfield, Artie Vanasec, Brunswick, Bud Graham, Buddy DeSylva, Carroll Martin, Chicago, Isham Jones, Jazz, Joe Miller, John Kuhn, Leo Murphy, Louis Panico, Vaudeville by R. Connor Montgomery. Bookmark the permalink.